Mass of Chrism is at 10am in St Eugene's Cathedral on Holy Thursday Morning. This is the only Mass in the Diocese on Holy Thursday Morning. The olive tree is the most common tree in Palestine and grows most abundantly in Galilee. Its oil is widely used: in the preparation of food, as fuel for lamps, for healing and massage and as a cosmetic to make the skin lustrous. The use of oil in sacred rites was common in the semitic world of the Old Testament. Jacob (about 1800 BC) erected a pillar at Bethel, where God had appeared to him, and anointed it to be a sanctuary – 'the house of God' (Genesis 28:10-22). When Aaron (about 1250 BC) and his sons were consecrated as priests they were anointed as were the Tent of Meeting and the Ark of the Covenant (Exodus 30:22-31). Kings were anointed: Saul, David (about 1000 BC) , Solomon - either by priest or prophet (eg. I Samuel 16:12,13). The purpose of anointing was to dedicate a person or object as sacred in God's service. The hebrew word messiah and its greek translation from which we derive the name Christ means 'the anointed one'. At the start of his ministry, in the synagogue at Nazareth, Jesus attributed the words of Isaiah to himself: 'The spirit of the Lord has been given to me, for he has anointed me …' (Luke 4:18) . St Peter expresses his faith that Jesus is the messiah in the words: 'You are the Christ, the Son of the living God' (Matthew 16:16). Reception of the sacraments of Baptism, Confirmation and Ordination to the priesthood and episcopacy are accompanied by anointing with the Oil of Chrism. These sacraments give a permanent, irremovable character - the seal of the Holy Spirit which lasts to eternity. They confer an intimate identity with Christ, conforming us, in the depths of our being, more closely to his person and his mission as priest, prophet and king. The anointing is the sign that a person has been chosen and consecrated to fulfil a specific role in God's plan under the influence of the Holy Spirit. The Oil of Chrism is also used by the bishop to anoint the consecration crosses on the walls of a church when it is consecrated and poured on an altar when it is dedicated. The blessing of oil is very ancient – there is documented evidence of this liturgy from the fourth century, but it is certainly of earlier origin. 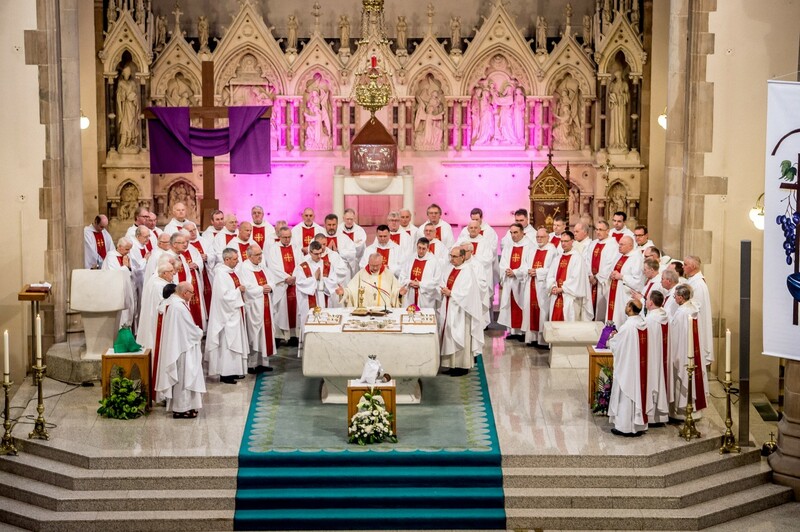 Today the People of God, bishops, priests, deacons and the lay faithful, assemble on Maundy Thursday at St. Eugene's Cathedral, Derry for the Chrism Mass with the main celebrant the Bishop of Derry. There is a long standing tradition that it takes place on the morning of Maundy Thursday in the Cathedral, where the bishop is surrounded by the priests of his diocese, whose presence demonstrates their unity with him. As Maundy Thursday is the day on which both the Mass and the priesthood were instituted, Pope Paul VI introduced the renewal of the priestly commitment into the liturgy. This is followed by the blessing of oils and the consecration of Chrism. The Oil of the Sick and the Oil of Catechumens are plain olive oil – the Oil of Chrism is perfumed with balsam. The Oil of the Sick is brought to the sanctuary by someone working in Hospital Chaplaincy. The Bishop blesses this oil praying: 'May your blessing come upon all who are anointed with this oil, that they may be freed from pain and illness and made well again in body, mind and soul'. Then the Oil of Catechumens is brought by someone who is to be baptised at Easter. The Bishop blesses this oil praying that God will 'give wisdom and strength to all who are anointed with it in preparation for their baptism'. Then a representative of those to be confirmed and ordained bring the Oil of Chrism. The Bishop breathes on this oil to invoke the Holy Spirit and consecrates it praying: 'make this mixture of oil and perfume a sign and source of your blessing. Pour out the gifts of your Holy Spirit on our brothers and sisters who will be anointed with it. Let the splendour of holiness shine on the world from every place and thing signed by this oil'. After the Mass, the deanery oil stocks are filled and taken back to the deaneries where the parish oil stocks are filled. They are collected so that they may be presented in each parish at the Mass of the Lord's Supper on Holy Thursday evening.